On a brisk fall day so many years ago I’m embarrassed to say, a friend of mine invited me to lunch at Café des Artistes, a hoity-toity restaurant on Manhattan’s Upper East Side. We’d been to the restaurant before, which is why we were a bit surprised when the waiter asked if we wanted a glass of wine as if he were a child asking for another ride on a rollercoaster. In fact, it appeared he was drunk. At 12:30 p.m. on a Thursday. At work. Thus began my decades-long love affair with Beaujolais Nouveau. And now that I’ve lived in France for several years, I can let you in on this secret French national holiday. Beaujolais Nouveau wine comes from – wait for it – the Beaujolais province of the Burgundy region of France, just north of Lyon, and is made from the Gamay grape. Beaujolais in and of itself is a light, fruity wine that can be drunk any time of year, but Beaujolais Nouveau is another beast entirely. Originally produced (and drunk) to celebrate the end of the harvest season, Beaujolais Nouveau Day, now set as the third Thursday in November (if you’re reading this in 2011, that means tomorrow, people! ), has been pretty much National Drinking Day in France since the early 1970s. 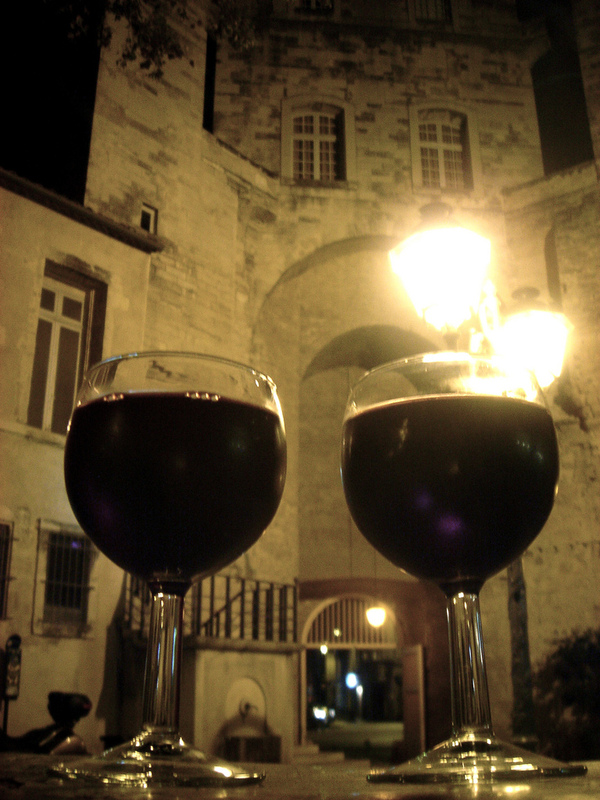 It’s a marketing ploy, pure and simple – but every bar, restaurant, café and even some grocery stores in France serve Beaujolais Nouveau throughout the rest of the day and night, which means it’s not unusual to see otherwise upstanding citizens washing down their morning croissant with a glass of the new wine. The most famous producer of Beaujolais Nouveau is Georges Duboeuf, whose specially designed colorful label will be the one you’ll most likely see at your local wine store. But there are several dozen vineyards that have hopped on this bandwagon, and wine bars both here and abroad have proper dégustations, or wine tastings, of more than one label. However, people rarely stay in one bar for a dégustation. You’re more likely to be served your Beaujolais Nouveau in a plastic cup, the better with which to stroll around town and hit up the food stalls. Here in Montpellier, where I live, paella is a favorite dish, although I always go for tartiflette – a potato-and-cheese concoction that keeps me going all night long. If you want to enjoy Beaujolais Nouveau back home, never fear – America, never one to shy away from a marketing ploy, has been pushing Beaujolais Nouveau as the official wine of Thanksgiving. So, be a good guest and pick up a bottle on your way to dinner! Christine Cantera writes the France Travel Guide for the BootsnAll Travel Network. She lives in the part of the South of France that is neither Provence nor the French Riviera. Christine was named 2010 Beaujolais Nouveau Champion at her local wine bar.